You and your friends can now belt out to some of your favorite songs from the coolest stars and shows - - sing to 35 chart-topping tunes including hits from Camp Rock, High School Musical, Hannah Montana, Cheetah Girls, as well as hits from Aly & AJ, Corbin Bleu, Everlife, Jordan Pruitt, and more. Take center stage as a solo artist and discover the inner performer in you in various single player modes. 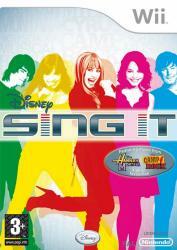 Release those vocal powers and challenge friends to a sing-off! You and up to seven of your friends will have the ultimate fun karaoke experience playing various multiplayer modes including duet, versus and team play.